A couple of hours after my arrival in West London, this adventure starts with me, comically overdressed and clutching a precisely wrapped bouquet of pink (as was instructed) roses in the cavernous Baker Street station. Two stops later, the District line train becomes the stage for more guests, all with varying types of pink flowers, dressed in their finest ’30s evening wear. It’s 11:45 am on a Saturday, and we are heading for the Grand Budapest Hotel. Based and so far operating exclusively in London, Secret Cinema is likely the most elaborate way to see a film. The premise is simple, but it’s out there: you buy a ticket, and then you receive (in this case) neurotically specific instructions including a map to a secret location no less than two days before the event. The Grand Budapest Hotel was a must for me, being a Wes Anderson obsessive and having been a temporary Londoner during my semesters abroad. This particular screening was my fourth for this film, which I have deemed one of the director’s masterpieces and certainly marks a degree of maturation for him. As a result, I couldn’t have been more elated to live, even if just for a few hours, within his imagined reality in my favorite city. Though, for the sake of honesty, I try to live in a Wes Anderson film every day. Going back about a month, my inbox chirped during one of my film classes. I had not been expecting an email from Secret Cinema until a day or so before my flight, but there it was, styled as if on old parchment and containing a page’s worth of meticulous instructions. I’m not keen on spoiling the surprise for anyone who plans on attending, but I will say that the aforementioned flowers and black tie attire are key to the aesthetic. Also recommended is committing to learning a brief poem to recite back to one of the hotel’s fellow eccentric guests. The sappier, the better. A few minute’s walk from the tube, some lobby boys and grisly men clad in black leather stand waiting at the mouth of an cruelly narrow alley (which isn’t an uncommon feature in central London, the global city built on cow paths of the Roman Empire). By 12:10, about a hundred men and women garbed in vintage black tie stand in the queue, much to the bewilderment of tourists who’ve somehow strayed from the path of the usual tour bus route. Periodically, a mock-up of Willem Dafoe’s character snatches an unsuspecting guest out of line, demanding to see immigration papers. It is the exactly correct measures of camp, wit, and commitment to the atmosphere of The Grand Budapest Hotel. In this massive group, we are then led to the site of a retired factory, where this Grand Budapest Hotel finds its home. Upon entry, smartphones (those perpetual fun-ruiners) are checked by lobby boys and girls into small velvet pouches to be held at the door for the duration of the event’s four hours. Two bars occupy a lobby which is otherwise kept open for dancing. Due to its setting, the hotel is less polished, but rather takes on a more bare-bones look, halfway between the hotel’s two appearances in the film. Throughout the three hours we are given to roam around the levels of the building which are opened to guest access like acts in a play. We are free to peep into hotel rooms, chat with Dmitri, the vitriolic son of Mdm. Desgoffe-und-Taxis, pay our respects to Mdm. D.G.u.T. with our pink bouquets, attend the reading of her will, or dip our toes in the Roman baths. In the final act, one can scale the Alpine Sudetenwaltz whilst the other guests waltz below. 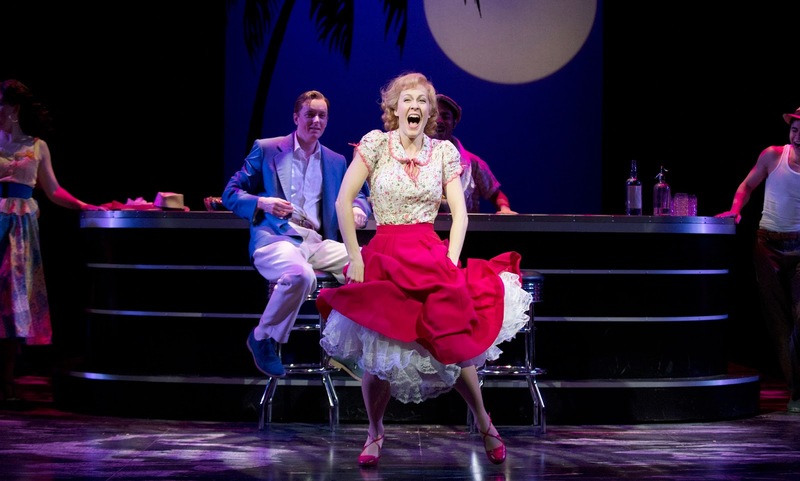 On the whole, the production is an extraordinarily faithful adaptation of both set and character. Milling about are about 50 actors, all of whom are loose adaptations of the film’s cast. For me, they are the key element in this incarnation of the Grand Budapest Hotel. They instigate trouble in many forms, peddle drinks and pastries, and in the final act before the screening, they lead a waltz in the lobby, surrounding the circular concierge desk with a flurry of feathers and patent shoes shined by the crippled shoeshine boy himself. They love causing scenes in the most delightful ways: at one point, the Countess suffers a melodramatic fainting spell in the middle of the lobby. Secret Cinema gave themselves a challenge when they lobbied to screen this film, but the care with which they produced the eponymous hotel was a privilege to behold. If you are in love with cinematic drama and are keen on living in it for a night, Secret Cinema screenings are the definitive way to see films in London. The winner of the female race Kenyan Priscah Jeptoo on First Avenue. Today is November 17, 2013. This is the date of the 35th Istanbul Marathon. Running from one continent to the other one —from Asia to Europe — it must be a unique experience for the runners. Two weeks ago, November 3, New York celebrated the 43rd ING New York City Marathon. After the 2012 NYC Marathon’s cancelation in wake of the Superstorm Sandy, and the 2013 Boston Marathon bombings, this one was very important for New Yorkers and marathoners. According to the information given by NY Road Runners more than 50,700 runners started this year’s race (last year it was 47,340), and 50,304 of them finished it. I love the marathon day in New York. That’s the only one that I can talk about, since I haven’t been to any other marathons to compare. I love that day in New York City; such a happy, joyful day it is. The people of New York line the 26.2 miles across the city to encourage runners. Every year, I like to stay close to the 60th Street on First Avenue which is the entrance into Manhattan after the Queensboro Bridge — also known as the 59th Street Bridge. Manhattan is ready for the runners at that spot. Portable toilets are located under the bridge, an official fluid and food station on First Avenue and the 61st Street is set up there , a band is ready, waiting, and NewYorkers, fans and runners’ relatives are there with flags, signs and bells to cheer them on. This year I decided to get there earlier than the previously to see the preparations and first comers. It wasn’t very crowded yet. The fluid & food station was getting set up, volunteers at the station were practicing how to hand off the cups and/or clapping and cheering. People were on the side making signs read “GO……GO!”, “RUN……RUN. First, the wheelchair athletes arrived. Wheelchair athletes were like bullets: boom, boom, boom; so fast. Well! The female and male athletes who entered Manhattan first, were not different than the athletes on wheelchairs; they were very fast too. And even some of them had smiles on their faces, as if they just started to run. Tsegaye Kebede, who completed the race in 2nd place, Jackson Kiprop (7th), Peter Cheruiyot Kirui (8th), Stanley Biwott (5th) and Julius Arite (4th). And the winner of the 2013 New York City Marathon, Kenyan Geoffrey Mutai was not among these five athletes. The road was getting crowded with runners as well as those on the sidelines. There were relatives who knew their loved ones’ running time and were trying not to miss them. People around me were waving different flags and yelling in different languages. The reactions coming from racers were different: some were smiling, others were thanking people, some were giving high fives and one wheelchair athlete was giving kisses. It was a wonderful day to remember! The next day on the streets of New York City, I saw some people wearing their commemorative medals — mostly, I guess, visitors. I told them, “Congratulations!” with a big smile. Some came, shook my hand and replied: “Thank you! And thank you for your encouragements.” Even the next day was wonderful! I hope the Istanbul Marathon will be as happy and joyful as the day of New York City’s marathon. One year ago today, Oct 29, 2012, New Jersey and New York were hit by Hurricane Sandy, also known as Superstorm Sandy. The damage was enormous: so many homes, businesses were destroyed. The storm surge at Battery Park in New York City reached 13.88 feet (4.23062 meter). Downtown Manhattan was flooded, and part of the city was in the dark for so many days. Manhattan wasn’t the only place in New York was affected by Sandy, but Coney Island in Brooklyn, Rockaway and Breezy Point in Queens and Long Island were also badly damaged. Wikipedia says that “at least 286 people were killed along the path of the storm in seven countries”. And according to CDC (Centers for Disease Control and Prevention) 53 of them in New York. I live in the Upper East Side somewhere close to the East River. When authorities gave a warning on November 28th about the severity of the approaching storm, I, like everybody, bought candles, batteries, canned food, water and filled containers with water, in case. And, then on that November 29, Sandy hit the city the boroughs and New Jersey as well. Upper Manhattan was OK, but not the Lower Manhattan. Let me take you back to those days and my experience of it through the images I took. On that Oct 30th, I walked from where I live towards downtown. At that point in time, there was no visible problem — the power was on and stores were open. But when I arrived at, I believe somewhere around 40th Street, the area plunged into darkness. People with flashlights in hand were very careful not to step on something dangerous. It was very eerie. Two days later a photographer friend of mine and I decided to go to the affected areas. Our first stop was Red Hook in Brooklyn. First thing we saw in Red Hook, Brooklyn, a boat landed on the street. Then we went to Coney Island. I clearly remember Coney Island Beach. The last time I was there it was nice, clean and full of people. This time it was filled with debris. From there we drove to Breezy Point, Queens. “Chaos vs. serenity.” Badly damaged, the restaurant’s floor was full of debris, yet glasses on the rack were intact, creating a wind chime-like, pleasant sound. The next day I went to Long Island, NY by myself. Sandy had caused severe damage there too. Houses were without roofs, boats were on the street, and there were piles of broken furniture, refrigerators, dishwashers, toys…. etc. everywhere. Signs that read “Looters will be shot” were everywhere. A car got stuck in two houses in Lindenhurst, Long Island, NY. And in Manhattan — since NY subways weren’t working after Sandy — buses were the only vehicles to take. As a result of the huge damage and deaths caused by Hurricane Sandy in many countries, the World Meteorological Organization decided never to use name “Sandy” for a North Atlantic hurricane. Today, a year after the storm, on this October 29, Hurricane Sandy is being remembered. Museum of the City of New York and the International Center of Photography organized an exhibition: RISING WATERS: PHOTOGRAPHS OF SANDY. There are 200 photographs in the exhibition — and one of them is mine -- which will be on view until March 2, 2014. At Canada’s eminent Shaw Festival, Bernard Shaw’s plays always receive pride of place—until this year. Only one Shaw play, Major Barbara, is being staged, along with an update of his Geneva to something called Peace in Our Time. I skipped both on my annual visit to the most picturesque small town in Canada, instead taking in a top-notch Oscar Wilde comedy, an obscure Somerset Maugham play and a great American musical. I (mostly) made the right choices. The musical, Guys and Dolls, is far more enjoyable than the recent Broadway revival. Most importantly, director Tadeusz Bradecki keeps the tough yet tender tone of Damon Runyon’s original New York stories—coupled with Frank Loesser’s first-rate, immediately hummable songs (like “Luck Be a Lady, “A Bushel and a Peck” and “Sit Down, You’re Rocking the Boat”), this is a delightful production from start to finish, with a good cast in top form, highlighted by Jenny L. Wright’s hilarious yet vulnerable turn as Miss Adelaide. Her rendition of “Adelaide’s Lament” is the ultimate showstopper. 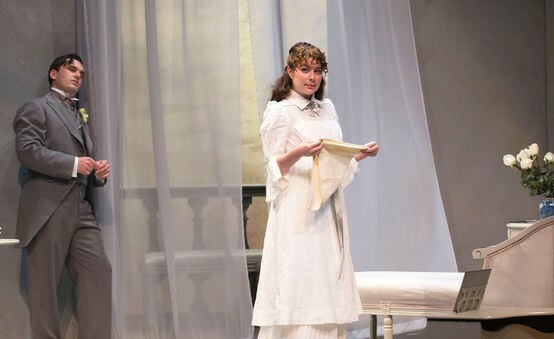 Oscar Wilde’s Lady Windermere’s Fan, subtitled A Play about a Good Woman, is so artfully crafted that one never realizes until the end how subtly it treats what seems an hackneyed theme: how gossip morphs into scandal, which was especially true in Wilde’s era. Why director Peter Hinton has cluttered such a sly, straightforward classic with unnecessary baggage like models posing as if in Whistler or Sargent paintings and epigrams written on curtains during scene changes or ludicrously blasting Katy Perry’s vapid pop song “Firework” as a coda is beyond my comprehension. Luckily, his largely compelling cast (Marla McLean is especially lustrous as Lady Windermere and Tara Rosling splendidly scandalous as Mrs. Erlynne) does its utmost best to keep the play in our sights. For that, we (and Wilde) are grateful. In Our Betters, a 1923 M. Somerset Maugham play receiving its first Shaw staging (I’ve neither seen nor read it), Americans in England are a desperately social-climbing lot hoping to be taken seriously by their “betters”: the English men and women whom they want to impress, maybe even marry. Although it sounds farcical, Maugham has sympathy for these people, giving them a dignity amidst their flaws that would be missing from a nastier portrait. In director Morris Panych’s nicely-paced staging, Claire Jullien and Catherine McGregor—two of the festival’s best—give vivid portrayals of American women who have been in England so long they’ve come to accept their position. This bittersweet play is beautifully played. souvenir of their visit), a new DVD, The Shaw Festival: Behind the Curtain, is not only a fine primer on the festival’s plays, theaters, and lovely Niagara on the Lake ambiance, but also an arresting demonstration of the rigor with which North America’s greatest repertory company develops its creative process for the dozen or so shows put on each season. Watching plays come to life in the hands of luminous performers as Moya O’Connell—whom I didn’t see in person this time around, alas—makes this well worth watching.